]Game 4 of the Western Conference Finals was a back and forth game between the two best teams in the league the NBA world desperately craved. Blowouts have been the story of the Conference Finals thus far and many hoped this series between the Houston Rockets and Golden State Warriors would eventually live up to the season-long hype. Game 4 lived up to the hype. The Rockets were able to recover from a 12-0 deficit and found a way to win after withstanding the 3rd quarter of death from the Warriors, leaving them down 10 going into the final period. 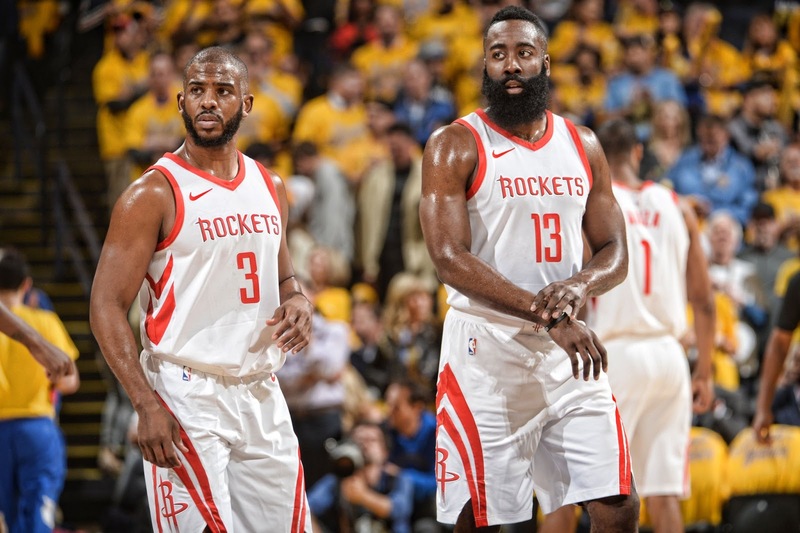 James Harden's monster first quarter kept the Rockets afloat until Chris Paul accompanied him in the 2nd quarter, as the star backcourt combined for 29 points in that quarter. Harden even had a series of steals in the 2nd quarter that gave the Rockets a nice cushion going into the half. Where the Rockets really made their mark was the 4th quarter. They had to undergo the 3rd quarter from the Warriors where they were outscored 34-17 and ultimately, the season seemed to be slipping away as a 3-1 deficit was likely going to be too much to come back from. Although Gerald Green may have bothered Rockets fans with his questionable shot selection, he had some defensive moments that were a factor in the final result. Green makes the concerted effort to stop the fastbreak from Curry. He does an excellent job of timing the layup to get the block and stop the onslaught from the Warriors. Hustle plays like that from Green stood out tonight. After Green gets beat on Curry's give and go with Draymond Green, he is able to recover and use his length and athleticism to block Curry's open shot. The Rockets were down 10 at this point and needed every stop possible in order to win this game. The defense was the storyline for the Rockets to win Game 4, particularly in the fourth quarter. They held the team with four All-Stars to 12 points in the quarter on 3-18 shooting to go along with four turnovers and just one assist that came in the first two minutes. For the entire night, they held the Warriors to 16 turnovers and only 14 assists. That speaks volumes for a team that averages 29 on the season. Locking down Curry after his monstrous 17-point third quarter seemed to be impossible, but the Rockets were able to accomplish just that. Curry was held to 1-8 shooting in the quarter while Kevin Durant was held to 1-5. To hold arguably two of the top three players to 2-13 shooting in the fourth quarter is incredible. Forcing Draymond to create for himself made him uncomfortable. It's never been his calling card and it worked in the Rockets favor. Gordon does a good job of keeping a hand up without fouling. Clint Capela is able to mostly stay with Curry on the drive and block the shot from behind. Gordon does a good job of coming over to help alter the shot as well. Once Harden went over to Shaun Livingston and realized Green switched onto him, he runs over quick to close out on what could have been wide-open three for Durant. Harden's effort on the defensive end all night really stood out. Trevor Ariza knows the inbounds play is coming on a short block. He has done the best job of defending Durant for the Rockets. Look at how well he moves his feet as Durant goes for the turnaround. That movement made it easier for him to get a hand in Durant's face. After Paul comes over in the slightest to help on Curry, he knows Thompson is going to get the minimal room he needs to get a shot off. He drifts all the way to the corner and Paul makes the effort to run over and get a hand up. P.J. Tucker deserves all the credit in the world on this possession. When Thompson drives, he quickly realizes Durant is left open and runs over to tag him. If Tucker does not tag him, Thompson could have kicked out to Durant and the outcome of this game could have completely changed. Tucker was just fantastic all night. His 16 rebounds and hustle plays were very much needed considering the Rockets didn't play a center outside of Clint Capela in Game 4. The closeouts were strong, he communicated well on the switches and was an anchor for the Rockets defense. Four of the 16 rebounds were on the offensive end, keeping some possessions alive. The Rockets could not ask for a better situation right now. Two of the final three games of the Conference Finals will be played in Houston in what has become a best-of-three. It was no secret the Rockets had the #1 seed as one of their top priorities in the regular season. Reclaiming home court advantage in Game 4 has all of their work in the regular season paying off.